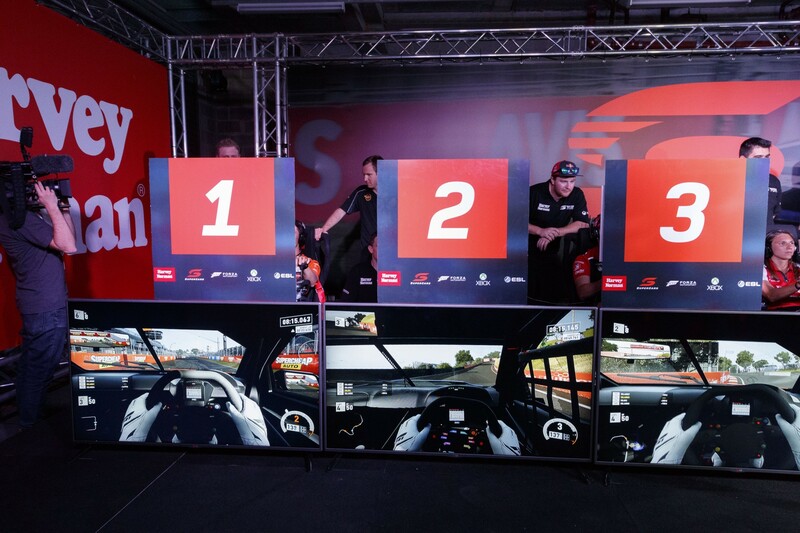 After nine heat races at three of the world’s most-famous racetracks, grid positions have been decided for Saturday evening’s Harvey Norman Supercars Forza Challenge Grand Final. Following his clean sweep on the opening day of of the inaugural competition, Andrew Dyson chalked up two more race victories to secure pole position. The eight finalists will line up for a 20-lap race around Mount Panorama on Forza Motorsport 7 from 7:30pm on Saturday evening, broadcast live on Supercars.com. While Dyson dominated early, Jacob Harvey took the ascendancy in the last round of heat races. He won the eighth and ninth races at Spa and Brands Hatch to finish just nine points shy of Dyson in the final standings, and will join him on the front row. Jarrod Lamprey also took a win, in Race 7 at Laguna Seca, to secure third place on the grid. “It was swings and roundabouts all throughout the heat races and by the end, we were all very competitive,” Dyson said. “It’s really hard to overtake without making contact but in saying that, all it takes is one mistake and you can lose several places.